Over the past decades, East Asia has rapidly grown. The parallel process of globalization makes developments in this region of great significance for other continents such as Europe. Taking into account that the EU has played a central role in shaping the world economy, it cannot but pay particular attention to organizations promoting economic integration. APEC is a considerable example as member economies account for approximately 40 percent of the world population and 55 percent of world GDP. The EU and APEC do certainly have important differences. The former is based on the obligations of member states and is partly governed by various supranational institutions such as the European Commission, while the latter is a group of 21 economies that voluntarily cooperate. The EU is making steps to strengthen economic governance and possibly acquire a federal structure in the future. For its part, APEC has no treaties and it functions on the basis of non-binding commitments of its member economies. All in all, the process of economic integration is pursued via different instruments and with a completely dissimilar logic. Furthermore, the EU and APEC differ because the first endeavors to be an active political actor in the international arena while the second remains an initiative of economic regionalism with an impressive geographical reach. The EU has a clear political identity, a contrast to APEC which is barely interested in dealing with security issues. In spite of problems of cohesion within the EU, its main ambition is to speak with one voice on the global stage and become a reliable international power. APEC has been never keen on serving such a goal. Differences in the structure and philosophy of the EU and APEC do not mean that these organizations will fail to find common objectives. In contrast, the trade volume statistics highlight their reciprocal usefulness and benefit. According to European Commission statistics, the total trade between the EU and APEC was approximately €1.87 trillion ($2.34 trillion) in 2013. Some 10 years earlier, the turnover was about €1.07 trillion. The EU trade with APEC represented 54.6 percent of its total trade last year while the relevant number for APEC in relation to its total trade was 34.7 percent. Products exported and imported include food, live animals, beverages, tobacco, crude materials, chemicals and machinery. Along with trade, another theme of collaboration between the EU and APEC is related to their attempt to find a harmonious platform of cooperation for the protection of personal data. In particular, the former has developed the Binding Corporate Rules and the latter the Cross-Border Privacy Rules. Hence, they often organize meetings in order to employ practical tools and facilitate efficient transfers of data used by companies doing business in Europe and the Asia-Pacific region. 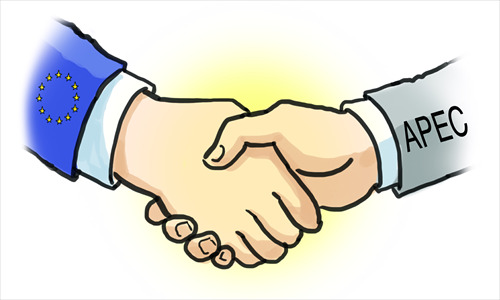 In February 2014, for instance, data protection authorities of both sides agreed on further joint work. More importantly, the EU and APEC can practically apply and promote the principle of multilateralism. Within the context of economic interdependence at the global level, they might initiate joint actions and projects as well as foster dialogue, interaction and brainstorming on critical issues. In spite of their differences, their economic agenda is rather similar. During the ongoing APEC week in Beijing, for instance, representatives of its member economies will no doubt emphatically express their commitment for the implementation of policies boosting innovation and growth, starting new infrastructure projects and creating quality jobs, especially for the young generation. These priorities could easily have been the main components of a European agenda as well. European leaders are publicly making almost the same remarks to citizens suffering by unemployment and poverty and expecting tangible solutions. To sum up, organizations such as the EU and APEC can share a global agenda looking toward the future. Regional cooperation and multilateralism are necessary presuppositions for successfully handling new challenges. These challenges are not limited to the financial sphere but also have a broader dimension. The Ebola epidemic, corruption, poverty, environmental pollution and climate change require joint responses.